When using meetings, you may get booked for times that were blocked off as Away, Tentative, Free, etc. on any of your integrated calendars, or there are less times available than you expected. There are settings for your connected calendar and for your meetings links that can cause unexpected availability. 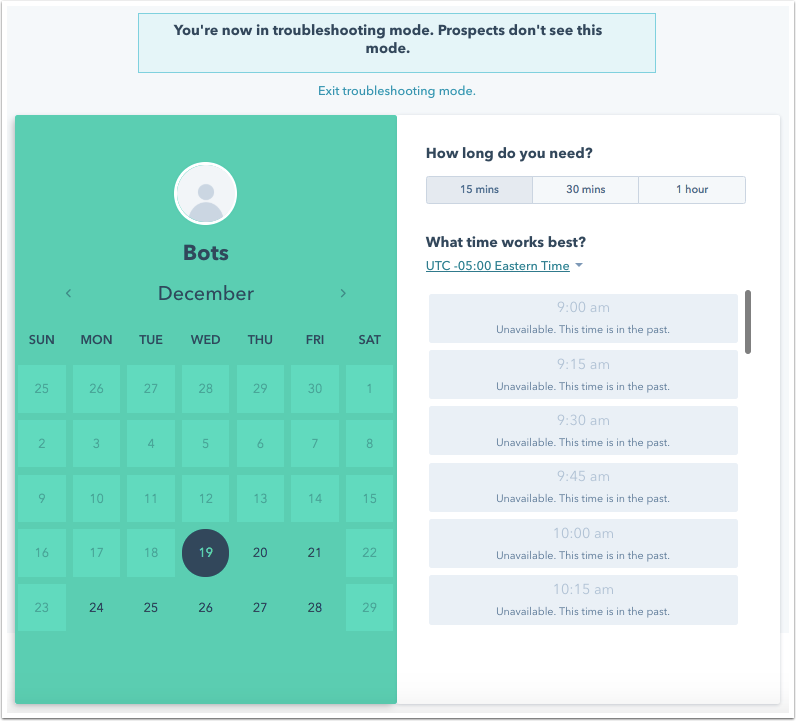 Please note: if you have access to more than one HubSpot account, log in to the account you used to create your meetings link before navigating to troubleshooting mode. Hover over a meeting link and click the Actions dropdown menu, then select Troubleshoot. Once you identify why your time is not available for booking, review the settings in your calendar and meeting link to address issues with your availability. Hover over a meeting link and click Edit. In the left sidebar menu, select Availability. Add any additional available time slots, then click Save. Please note: if you see the error: This day falls outside when meetings can be schedule, review your meeting link's configuration. In the left sidebar, select Configuration, then click to expand your Advanced Settings. Click the When a meeting can be scheduled dropdown menu to update the timeframe when a meeting can be scheduled. When using meetings with your Outlook 365 or Gmail calendar, you can still get booked via meetings if you have time blocked off as Away, Tentative, Free, etc. on any of your integrated calendars. Only time slots on your calendars marked as Busy will be unavailable for bookings. In order to avoid getting booked for a time you're busy make sure your calendar event is set to Show as Busy. This will work for specifically scheduled calendar events as well as All day calendar events. If you have an all-day event on any of your integrated calendars (such as a conference) and you want to be available for meetings during this time, set this event to show as Free. Please note: any all-day events on your Outlook 365 calendar will be reflected in your meetings links based on the time zone of your HubSpot account, even if your Outlook 365 calendar is set to a different time zone. In order to avoid getting booked for a time you're busy, make sure your calendar event is set to Busy. This will work for specifically scheduled calendar events as well as All day calendar events. 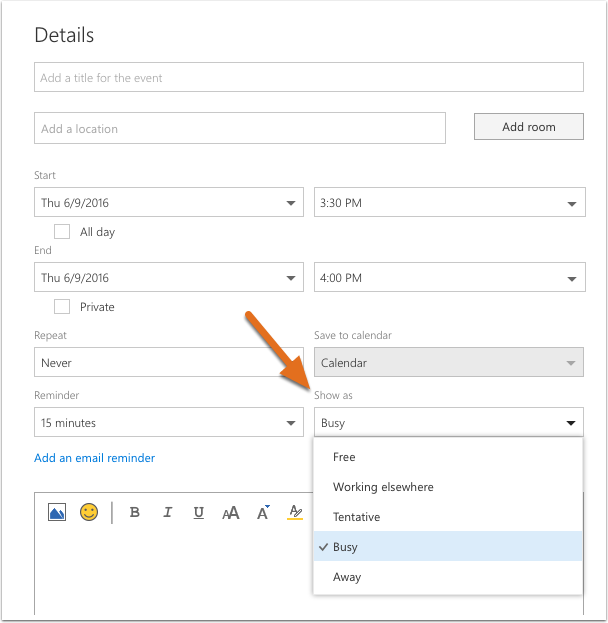 If you have an all-day event on any of your integrated calendars (such as a conference) and you want to be available for meetings during this time, set the event to show as Free. Please note: HubSpot does not take into account Google Calendar working hours for meeting availability. If you see the error Too soon for minimum notice time or Buffer time conflict, review your meeting link configuration settings. Hover over your meeting link and select Edit. In the left sidebar menu, select Configuration. Click to expand the Advanced settings menu. To resolve the Too soon for minimum notice time error: click the Minimum notice time dropdown menu and select a longer minimum notice time. To resolve the Buffer time conflict error: click the Buffer time dropdown menu and select a different buffer time.